This Yarn Dream Catcher is a great Native American craft for kids, hang it up and catch all your dreams! 1. Cut your paper plate or cardboard into a ring. It's important that the material you are using for your ring is sturdy, otherwise it will just buckle when you begin to wrap the yarn around it. 2. Cut slits all around your paper plate, make at least 8 slits around. 3. Glue or tape the end of the yarn to the back of your ring. Begin to string your yarn through the slits all around the ring, making an uneven criss-cross pattern. 4. When you are happy with your pattern cut the yarn, leaving a little extra. 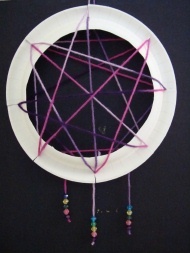 Glue or tape the extra yarn to the back of the ring, making it into a loop shape to hang your dream catcher. 5. Cut 3 lengths of yarn, tie a knot at the end of each. String beads onto the yarn and glue or tape them to the back of your dream catcher. Other options for this craft include, gluing feathers onto the ends of the beads and, stringing beads on your yarn before you start threading through the slits in the ring, the beads will show up in the middle of your dream catcher. We used varigated yarn for our dream catcher, this is yarn that is made with more than one color. This type of yarn makes for a really colorful dream catcher!